Peter Weston in 2005. Photo by Bill Burns. 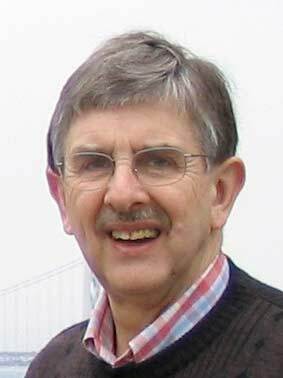 Peter Weston, a prolific fanzine publisher and convention organizer, one of the most influential British fans during his lifetime, died of complications of cancer on January 5. He was 73. Weston discovered fandom in January 1963 at the age of 19. Rummaging through the SF books on sale in the Birmingham Rag Market, he found a slip of pink paper in one of them. “Are you interested in SF?” it asked, exhorting him to “Join the Erdington SF Circle.” Weston soon became active in Birmingham fandom and by November 1963 had published the first issue of his fanzine, Zenith. In the mid-Sixties, Weston wrote a fan news column for the British Science Fiction Association’s fanzine Vector under the pseudonym “Malcolm Edwards” – which had humorous consequences when, a few years later, a real Malcolm Edwards joined fandom and was greeted by people who expressed their pleasure at finally meeting him. By coincidence, both the fake Malcolm Edwards and the real Malcolm Edwards went on to chair British Worldcons. In the Seventies, Weston held three Speculation Conferences in Birmingham (1970-1972), science fiction symposia inspired by his fanzine. He co-founded the Birmingham Science Fiction Group (BSFG) in 1971 and helped originate the convention Novacon that same year. He edited three volumes of the Andromeda anthology (1976, 1977, 1978). 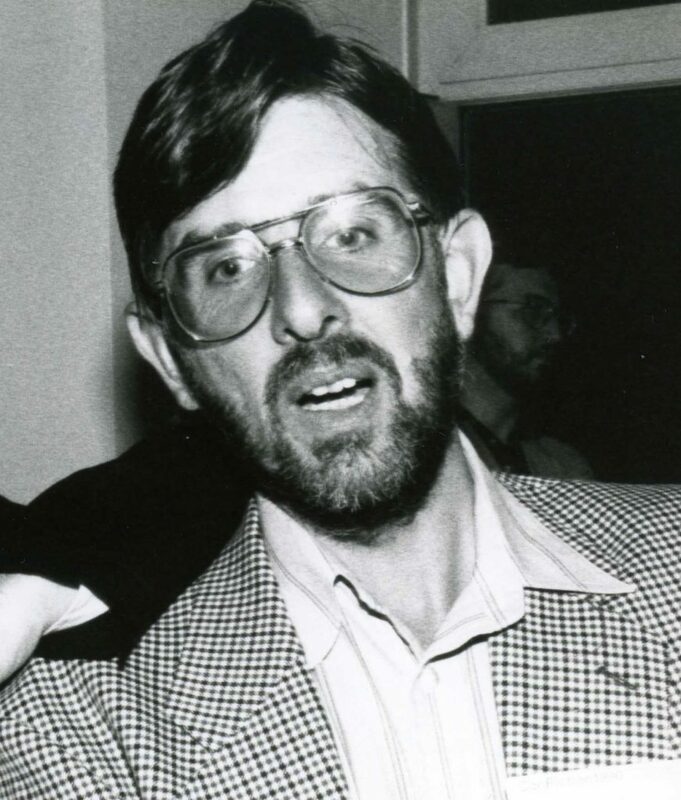 Peter Weston and Ron Bounds at Discon II (1974). Weston was voted Trans-Atlantic Fan Fund delegate in 1974 and traveled to Washington DC for Discon II — even though this meant leaving behind his pregnant wife, Eileen, who gave birth four days after he departed, according to his trip report Stranger in a Very Strange Land. While in America he gathered support for a newly-created British bid for a Worldcon he would end up chairing at the end of the decade, Seacon ’79 in Brighton. In his professional life, he once owned a foundry that produced the chrome-plated automobile door handles and hood ornaments for Jaguars, a technology he also put to use (beginning in 1984) manufacturing the rockets for the Hugo Awards. 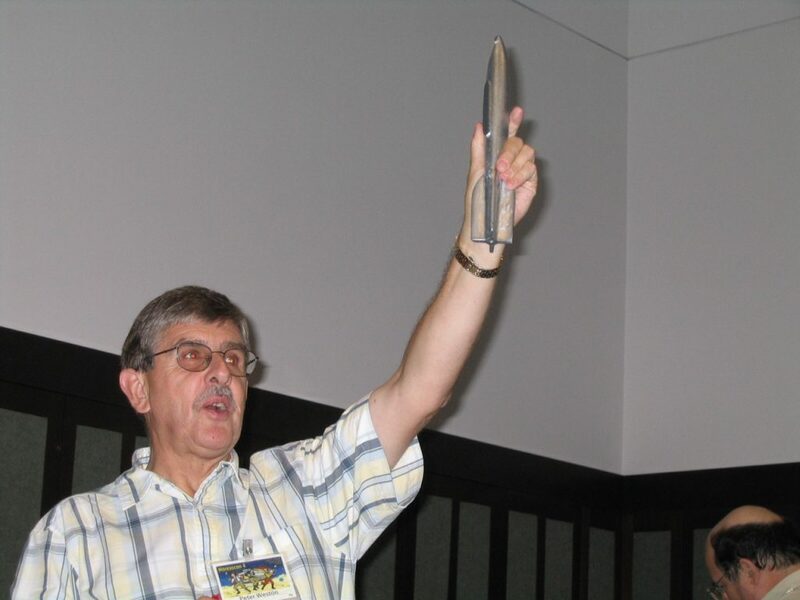 Peter Weston auctioning a Hugo rocket during Noreascon 4 (Boston), the 2004 Worldcon during which he was a Guest of Honor. Photo by Murray Moore. 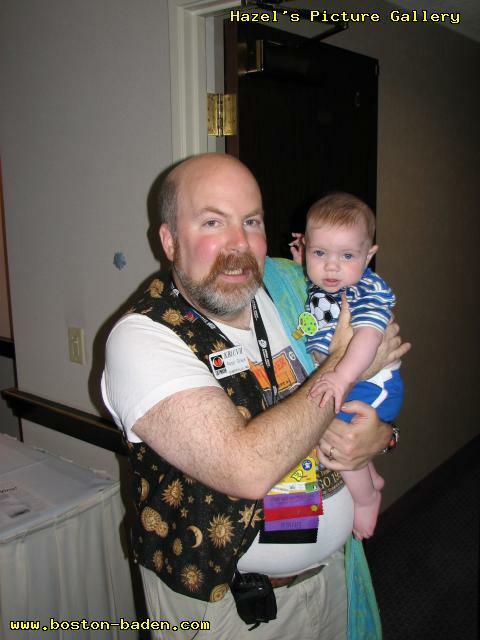 Weston was a Worldcon guest of honor at Noreascon 4 in 2004, where his memoir With Stars in My Eyes: My Adventures in British Fandom was released. The volume knitted together several of Weston’s autobiographical articles, including two that held the record for number of views on Victor Gonzalez’s early fannish blog, Trufen. In 2006, Weston revived his fanzine Prolapse (re-titled Relapse in 2009) after a 23-year hiatus. He concentrated on publishing articles about fanhistory. Issues can be downloaded from eFanzines. Even this full resume of his activities barely suggests his social impact among his friends in fandom, where he was valued as a raconteur, or diplomatic skills, especially a rarity in early Seventies fandom when it still was an anarchic community largely composed of young men. Weston’s funeral will be on January 23 at Sutton Coldfield. He is survived by his wife, Eileen, and his daughters. Update 01/10/2017: Changed year of birth to 1943 per correction in comments. Terry Pratchett passed away March 12 at home surrounded by his family reports his publisher. He was the author of 70 books, among them 40 in the Discworld series of comic fantasies that began with The Colour of Magic in 1983. Pratchett’s first sale was a short story, “The Hades Business,” published when he was 15. 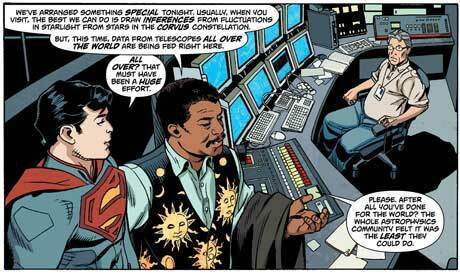 Early in his career he worked as a journalist and as a press officer for nuclear power generating utility. 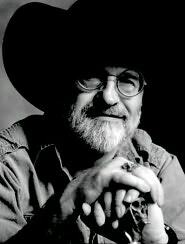 Pratchett co-authored The Science of Discworld with Ian Stewart and Jack Cohen, a Hugo nominee in 2000. He was a guest of honor at Noreascon 4, the 2004 Worldcon. I spoke to a fellow sufferer recently (or as I prefer to say, ‘a person who is thoroughly annoyed with the fact they have dementia’) who talked in the tones of a university lecturer and in every respect was quite capable of taking part in an animated conversation. Nevertheless, he could not see the teacup in front of him. His eyes knew that the cup was there; his brain was not passing along the information. This disease slips you away a little bit at a time and lets you watch it happen. He also investigated “assisted suicide” (although he disliked that term), wrote a public lecture, Shaking Hands With Death, in 2010 and in 2011 presented a BBC television documentary on the subject titled Terry Pratchett: Choosing to Die. However, The Telegraph reports that his death was natural. 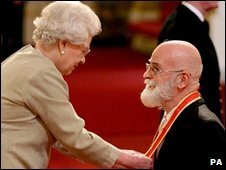 Pratchett was knighted by the Queen for his services to literature in a 2009 ceremony, Elizabeth dubbing the kneeling author on each shoulder with her sword. Although he did not win a Hugo or Nebula, he received many other accolades: a World Fantasy Award for Life Achievement (2010), the Andre Norton Award (for YA sf/f, presented by SFWA in parallel with the Nebulas) for I Shall Wear Midnight (2011), the British Science Fiction Association Award for his novel Pyramids (1989), the Mythopoeic Award for Children’s Literature for A Hat Full of Sky (2005), and the Prometheus Award for his novel Night Watch (2003). An asteroid (127005 Pratchett) is named after him. Last April Sir Terry Pratchett was the Author of the Day for the Opening Day of the 2014 London Book Fair. In December he and his friend and collaborator Neil Gaiman made cameo appearances in BBC Radio 4’s production of Good Omens. After learning of his friend’s death, Neil Gaiman published an emotional tribute. Admitting he knew Sir Terry’s death had been coming, he said, “it made it no easier”. I woke up and my email was all condolences from friends, and requests for statements from journalists, and I knew it had happened. I’d been warned. I’m not up to writing anything yet. Maybe one day. Update 03/12/2015: Corrected an award citation to British Science Fiction Association Award. Charles Addams painting done in 1946. ”Addams Family” cartoonist and creator Charles Addams original 1946 painting personally owned by Ray Bradbury. 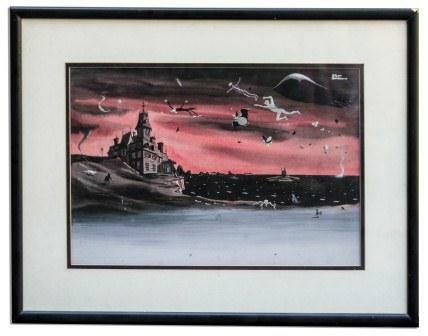 True to Addams’ whimsical and macabre tone, painting depicts a landscape scene at twilight with a Gothic mansion overlooking a shore, and with ghoulish creatures and spirits ascending towards the house. Signed, ”Chas Adams” at upper right. Mixed media on illustration board was selected to be the cover image for Bradbury’s book, ”From the Dust Returned”, which was released in 2001. Painting measures 17” x 12” and is matted and framed to an overall size of 24” x 19”. 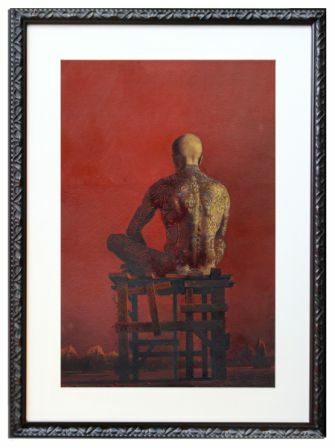 They’re asking at least $6,000 for the iconic Dean Ellis painting commissioned for the cover of The Illustrated Man published by Bantam Books in 1969. Ray Bradbury’s 2004 Retro Hugo for Fahrenheit 451. The Retro Hugo Award that Bradbury’s Fahrenheit 451 won at the 2004 Worldcon could be yours for $5,000 (if nobody bids higher). That might be a reasonable asking price — Harry Warner Jr.’s Hugo went for $2,000 at auction in 2012. The association of this Hugo with a more famous winner ought to drive up the value. Hugo Award presented to Ray Bradbury at Noreascon 4, the 62nd World Science Fiction Convention in 2004. Trophy honors the great author as part of the Retrospective Awards in the category of Best Novel for ”Fahrenheit 451”. Iconic sci-fi trophy features a sleek figural metal sculpture of a rocket pointing skyward, mounted to a wooden base with the information plaque affixed to one of the three sides. The other two sides are studded with rings of 13 stars. To the underside, the name of the trophy’s designer, Patrick J. O’Connor is engraved. Measures 17” in total height; base sides each measure 7”. The hundreds of items of art going under the hammer include works by Joseph Mungiani, Hannes Bok,Milton Caniff, Al Capp, Ron Cobb — and Joseph Lane’s portrait of Bradbury from the Hollywood Brown Derby. 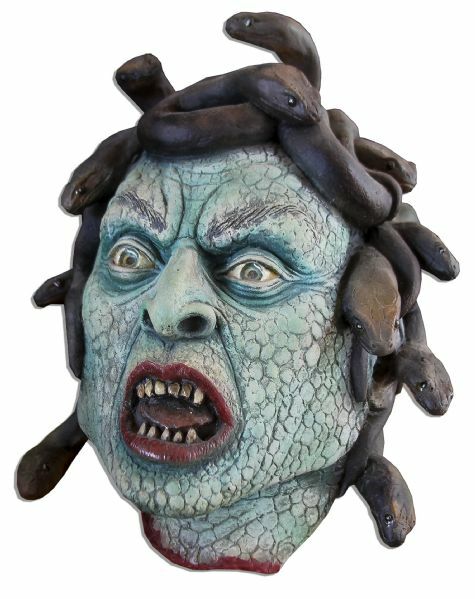 Ray Bradbury personally owned Medusa mask. Rubber cowl features a hideously delightful green textured face with pointy teeth and a wide-eyed, open-mouthed expression. Snakes emanate from the head in conformity with the myth. Possibly a movie prop from the 1981 film ”Clash of the Titans”. Measures 11” x 13” x 9”. Near fine. With a COA from the Ray Bradbury estate. It was indeed made by Ray Harryhausen (though the catalog doesn’t say so), and once sat on top of the refrigerator in Bradbury’s Palm Springs home according to John King Tarpinian. Marty Gear at 2009 Arisia. Photo by Daniel P. Noé. 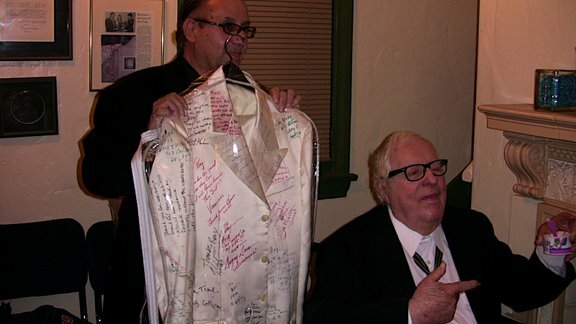 Legendary costuming fan Marty Gear, whose fanac spanned six decades, died in his sleep on July 18 at the age of 74. Marty and his wife, Bobby (who predeceased him in 2005), won many awards in masquerade competitions. He founded The Greater Columbia Fantasy Costumers’ Guild, a forerunner of the International Costumers’ Guild, was the ICG’s first Executive Director, and was honored with the ICG’s Lifetime Achievement Award in 1991. 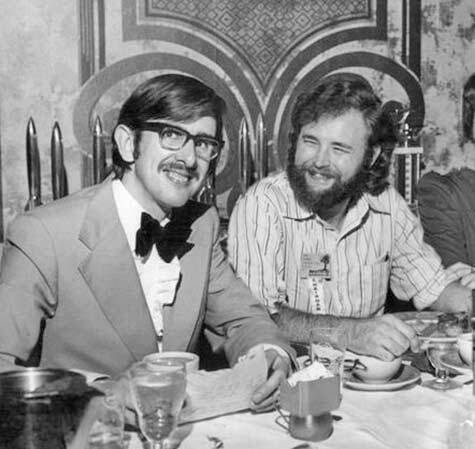 Despite this friendly encounter with one of the field’s most loved writers, Marty did not attend another SF con until 1977 when Page Cuddy and David Hartwell “conned” him into going to a Balticon in order to meet Philip Jose Farmer. After that Marty rapidly developed into a fannish leader. He ran programming for Balticon 13 in 1979 and became a regular fixture as the con’s masquerade director beginning in 1981. He chaired CostumeCon 3 (1985) and Balticon 21 (1987). One of his most challenging moments came while directing the 1998 Worldcon (Bucconeer) masquerade — at the start he stumbled against a table of awards and took a four-foot fall off the stage. Quite the trouper, Marty got right back up and did his job without visible problems. He even looked in pretty good shape the morning after at the masquerade critique where he had nothing to say about his mishap except an apology for detracting from the costumers. He did use a cane for awhile afterwards, though. Marty remained an active member of the Baltimore Science Fiction Society, and at the time of his death was parliamentarian of the BSFS Board of Directors, coordinator of the Jack L. Chalker Young Writers’ Contest, and liaison to the school for the BSFS Books for Kids program. Over the years he was a guest of honor at Unicon 87, Disclave 34, Sci-Con 8, Genericon 2, Arisia 9, and Balticon 30. Professionally, Marty managed his own company Martin Gear Consulting Ltd.
Other than dressing as a vampire, Marty said one of his favorite costumes was “Cohen the Barbarian” a prize-winner at the 2004 Worldcon as “Best DiscWorld Entry.” His Cohen wore a fur diaper, a very long white beard and an eyepatch — and not much else. In one hand he carried a sword and in the other a walking cane. 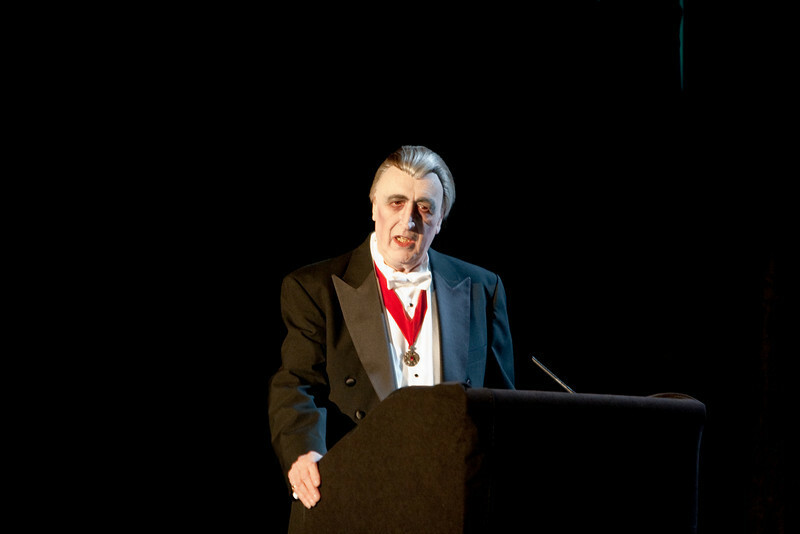 See Marty in his Dracula garb start the 2008 Balticon masquerade with a horrible joke. Pam Fremon died November 7 of a heart attack reports Deb Geisler. Fremon, a long-time NESFA member, lived in Waltham, MA. She chaired the 2002 and 2006 Boskones, served several terms as Clerk of the NESFA, and was selected a Fellow of NESFA in 1990. “At Noreascon Four, [Pam] was the goddess of signs, pumping out many, many signs for the convention while not-quite chained to the large-format printer we had bought for the task,” said Deb, pointing to the photo below. I remember the deftly humorous meeting reports she wrote when Clerk of the NESFA – some bits so funny I had to share them in File 770. Here are two examples: each begins with my couple of lines of introduction, followed by Pam’s quotes. “We stole away into the night, mindful of the wolves. “Through the years, many creatures have, of course, chased NESFAns on the way to Other Meetings — such a common occurrence that it has never seen mention in Instant Message….until now. Pam Fremon with the large-format printer at Noreascon 4. Our “Ladies Sewing Circle…” got together their sewing machines, scissors, pin cushions, and a couple of hundred yards of starry fabric and began to make vests (for the SurRealEstate brokers, of course). Eventually, they custom-made about 300 vests for committee, friends of the bid, and potential guests of honor of the 2001 Worldcon. Peter Grace wearing his starry vest at L..A.con IV (2006). Photo by Chaz Boston Baden. The official Anticipation Masquerade video is available on DVD from CreateSpace for $9.95 plus shipping, reports Video Director Syd Weinstein. Quite a few videos of North American Worldcons (and the latest Arisia) are for sale via CreateSpace. Anticipation Masquerade: Edited video of the event complete with the awards. Denvention 3 Masquerade: Denvention 3 Masquerade hosted by Wil McCarthy — 31 entries including 3 in the young fan category. Includes the presentations, the half time slide show of past masquerade entrants over the years, and the awards ceremony. Noreascon 4 Opening/Closing/Highlights: Opening and Closing Ceremonies, plus a highlight reel of all of the events. Noreascon 4 Time Machine (Retro Hugos): Includes the 1954 Retrospective Hugo Awards Ceremony hosted by Bob Eggleton and interviews with the Noreascon 4 Guests of Honor hosted by Peter Weston. Noreascon 4 Masquerade and Awards (Two Disks): Masquerade hosted by Susan de Guardiola. Disc one includes the masquerade presentations and a montage of the awards. Disc two is the masquerade awards including young fan, special Discworld, and the main awards. Noreascon 4: Hugos: Hugo Awards Ceremony hosted by Neil Gaiman. Noreascon 4: Five Disk Set: Official 5 DVD set of the entire week’s programming in the main auditorium. Bonus feature: time lapse video of the entire week, including build, shows, and teardown. Arisia 2009 Masquerade: Boston-area convention masquerade. Weinstein adds that the video of Anticipation’s Hugo Awards ceremony is still in production. Note: The names above the dashed line were finalists. The links are included as a public service to anyone whose shouting “Who in hell is that?” is more than a rhetorical question. The list is incomplete, unfortunately. Joe Major’s Alexiad and John Hertz don’t have websites. Also, if Alexis Gilliland, Sue Mason, Marc Schirmeister, Dan Steffan or Steve Stiles keep up a website we didn’t find it, though we added a representative link in a couple of instances anyway. A Google search on the fanartists’ names also will lead to numerous individual examples of their art. You are right if you suspect two of the top 15 fanzine nominees are obvious semiprozines getting votes from people confused about the categories. The Fortean Bureau is a magazine of speculative fiction. Lady Churchill’s Rosebud Wristlet actually got nominations for both semiprozine and fanzine, but reveals online it is a market for fiction, non-fiction, poetry, and black and white art.